Kenneth Davids is editor, chief writer and co-founder of Coffee Review. He has been involved with coffee since the early 1970s and has published three books on coffee, including the influential Home Roasting: Romance and Revival, now in its second edition, and Coffee: A Guide to Buying, Brewing and Enjoying, which has sold nearly 250,000 copies in five editions with a sixth edition scheduled for 2017. His workshops and seminars on coffee sourcing, evaluation and communication have been featured at professional coffee meetings on six continents. He is Professor Emeritus of Critical Studies at the California College of the Arts in San Francisco. In 1996 he was awarded a Special Achievement Award for Outstanding Contributions to Coffee Literature by the Specialty Coffee Association of America. Ron Walters manages business operations, including CoffeeReview.com, marketing and social media for Coffee Review. 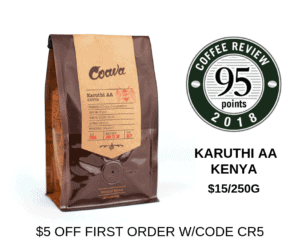 In 1996, he conceived of and helped pioneer the development of 100-point reviews in the specialty coffee industry with Co-Founder Kenneth Davids. For the past twenty years, Ron has been engaged in strategy, marketing, and management of specialty food and beverage businesses. Kim Westerman, managing editor of Coffee Review, is a licensed Q-grader, a longtime food, wine and travel writer, and a certified sommelier. Her work has been published in the New York Times, Forbes, the San Francisco Chronicle, Bay Area Bites, and many other publications. She happily brings her sensory training in wine to the evaluation of coffee in Coffee Review’s Berkeley lab. She also handles communication with roasters and review logistics. Jason Sarley has worked alongside Kenneth Davids as cupper, roaster and writer at Coffee Review since 2012. Jason is a licensed Q-grader and holds a Roasting Certification from The Roasters Guild. He also is a consultant and partner with Voga, an innovative coffee-brewing manufacturer based in San Francisco. Prior to joining Coffee Review, Jason taught classes on tea and traditional tea brewing ceremonies in San Francisco.